William Morrow Paperbacks, 9780062698247, 416pp. Claire thought she had everything a woman was supposed to want—a loving husband, a newborn son, a beautiful home in the suburbs. Then she walks in on her husband canoodling with their realtor in their newly renovated kitchen, and in an instant, her perfect life comes crashing down. With her marriage heading for divorce, Claire knows it’s time to stop feeling sorry for herself. But how can she move on when she’s still stuck in the orbit of her husband’s world? For starters, she can get rid of her soon-to-be ex’s possessions—including his prized, gigantic foosball table—by dumping them onto the curb…until complaints from the neighbors get the police involved. Now Claire is busy dodging the mean mommies at story hour and hiding from her ex-husband’s girlfriend in the grocery store. But as Claire soon learns, suburbia still has a few surprises in store for her—surprises that will make her question her choices from the past, send her down an unexpected road to self-discovery, and maybe even lead to new love. Desperate for a positive outlet to channel her frustrations, she turns to girlfriends Lissy and Antonia for help. Together they join forces to rebrand Lissy’s local stationery store and turn it into a thriving business. But as Claire soon learns, suburbia still has a few surprises in store for her—surprises that will make her question her choices from the past, send her down an unexpected road to self-discovery, and maybe even new love. 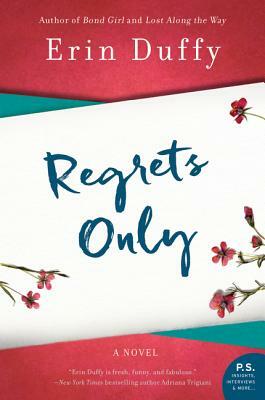 Featuring a second coming-of-age story, Regrets Only deftly explores the subtle nuances of marriage, family, friendship, and what it means to be a woman today, while delighting readers as its unforgettable heroine acts on impulses we’ve all been guilty of having. Erin Duffy graduated from Georgetown University with a B.A. in English and worked on Wall Street, a career that inspired her first novel, Bond Girl. She lives in New York City with her husband (whom she met the old-fashioned way—in a bar). Duffy’s second novel is tenderly introspective. . . . Abby’s attempts to navigate the everchanging rules of dating are infinitely relatable and will prove to be an ideal beach read for fans of Elin Hilderbrand and Sarah Pekkanen.